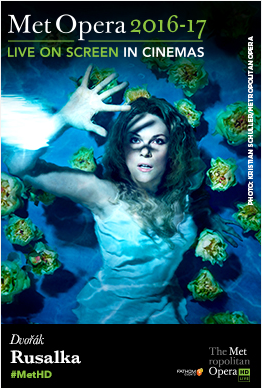 Enter to win an Admit-Two Pass to see Rusalka! Mind on Movies is very excited to announce that we are working with Fathom Events on Rusalka, in selected theaters on Saturday, February 25 at 12:55 p.m. ET to giveaway an admit two to select winners. Kristine Opolais stars in a new production of the opera that first won her international acclaim, Dvořák’s fairy tale opera about the tragic water nymph Rusalka. Sir Mark Elder conducts Mary Zimmerman’s new staging, which also stars Brandon Jovanovich as the human prince who captures Rusalka’s heart; Katarina Dalayman as Rusalka’s rival, the Foreign Princess; Eric Owens as the Water Sprite, Rusalka’s father; and Jamie Barton as the duplicitous witch Ježibaba. Special Fathom Features: Go behind the scenes with the Met's stars! During intermission, interviews with cast, crew and production teams give a revealing look at what goes into the staging of an opera. The broadcast of Dvořák’s Rusalka will be presented live in select cinemas nationwide on Saturday, February 25 at 12:55 p.m. ET / 9:55 a.m. PT, followed by an encore presentation on Wednesday, March 1 at 6:30 p.m. local time. a Rafflecopter giveaway Disclaimer: Only one entry per mailing address per giveaway. The prize will be sent via FedEx or UPS. No P.O. Boxes please. This contest is from Mind on Movies working with Fathom Events. The entries will be checked. You must do what it says on the widget option to enter to win.